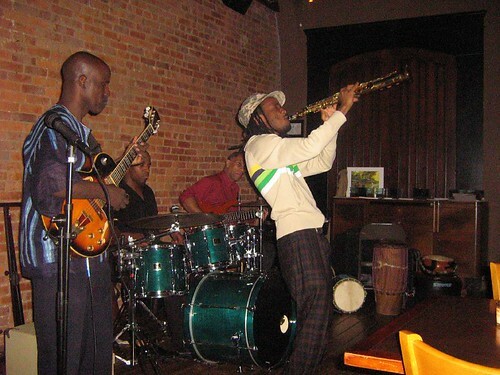 Haitian jazz band Mozayik was at Solomon's Porch in Bed Stuy last Saturday. I brought back a slideshow. A benefit for New Orleans was happening the same night not too far away at the Brooklyn Lyceum. 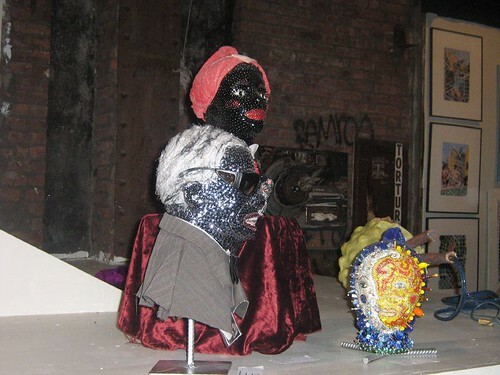 I have shots of some of the artwork exposed. The benefit also featured several ballrooms, lots of food and live brass. See slideshow. I'm here at the Ted Turner/UN event at Reuters. 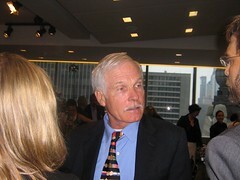 I just asked Ted Turner what he thinks of Yon Ayisyen's comments that I outlined in my last post. Namely, that it is not always clear how effective the UN Mission in Haiti (MINUSTAH) is in peace-keeping and even in effective elections observing. I asked him since he gave them so much money, whether he'd heard about that? He thought that generally his impression was that they were effective. He said that he thought the US itself should be doing more about Haiti because it is in the US' backyard. He said that he thought that the resources used towards Afghanistan (or was it Irak?) would have been better used in Haiti. When you talk, will this man listen? Let's find out on Tuesday. What is your opinion of the United Nations? 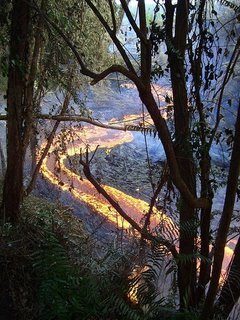 What kind of impact has it had on your country and people? How should it be reformed? Who should lead it? Global Voices is hoping to share your views in a conversation with the U.N.'s largest private donor, media mogul Ted Turner- a.k.a. "The Mouth of the South." HOW TO JOIN US ONLINE: On Tuesday September 19th at 4pm New York time, 19:00 20:00 GMT (please note corrected time! ), Ted Turner will sit down with Reuters journalist Paul Holmes and conduct a conversation which will be webcast live online around the world. Click here to watch the webcast and read more about the event. HOW TO SHARE YOUR QUESTIONS AND VIEWS: As you watch or listen, you can join the discussion by clicking here and participating in a live online chat. I will be in the room, along with Caribbean editor Georgia Popplewell Alice Backer, and Kamla Bhatt. The four of us will be raising our hands aggressively to ask questions on your behalf. HAVE MORE IMPACT BY BLOGGING: A great way to help influence the conversation is by blogging your views on the subject before the event even starts. 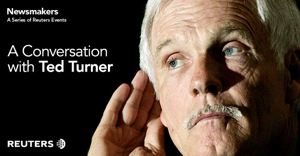 Please tell us what questions Paul Holmes ought to be asking Ted Turner, and what you think the conversation should focus on. When you write your blog post, please be sure to tag it with "gv-un" in Technorati and/or del.icio.us. Or share the link with us as trackback to this post, or paste it in the comments section of this post. Note that Turner has some fairly strong criticisms of big U.S. media. He has said that if he was still running CNN, he would do some things differently and focus more on international news. Is the legendary "Mouth of the South" as good at listening to and conversing with people from around the world as he is at broadcasting his own views?? Let's put him to the test. It should be interesting. 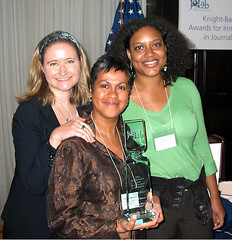 Global Voices Won the Knight-Batten Award! This morning in DC, Rebecca McKinnon, Georgia Popplewell and I (pictured in that order) represented Global Voices Online at the Knight-Batten award ceremony in DC. It was both exhausting (we each made a presentation) and exhilirating but in the end all the emotions were worth the while. I talked about starting my blog to amplify a more complex set of voices from Haiti than usually featured in mainstream media. Then I showcased three of the bloggers in Francophonia: Tony Katombe from the DRC, Pierrot Dupuy from La Reunion and Le Blog de [Moi] from Martinique. Hopefully video of the presentation will be up soon on the Knight-Batten site. Georgia live-blogged the conference over at Caribbean Free Radio here, here and here. The Global Voices community is ecstatic! Rachel Rawlins, our Managing editor, posted this on the GV website to announce the news. It is great to see all the hard work that gets put into GV rewarded. See more photos from this morning. Reunion is a Creole-speaking island in the Indian Ocean, to the east of Africa near other creole or french speaking islands such as Mauritius, Mayotte and Madagascar. It is also a French overseas department, like its Caribbean counterparts Martinique and Guadeloupe. It's got a very active blogosphere relative to those counterparts and to many francophone countries for reasons I am not entirely sure about. I am cross-posting here what I wrote about it on Global Voices yesterday. Alongside the Democratic Republic of Congo, Reunion a French Overseas Department located in the Indian Ocean to the East of Africa has one of the most active blogospheres in the francophone world. Its portal Reunion Permanente either explains the bustling activity or illustrates it. The portal even keeps track of overseas Reunion bloggers such as Sandy of Reunion-USA2 who lives in the United States; her blog seeks to explain her reactions to American culture. 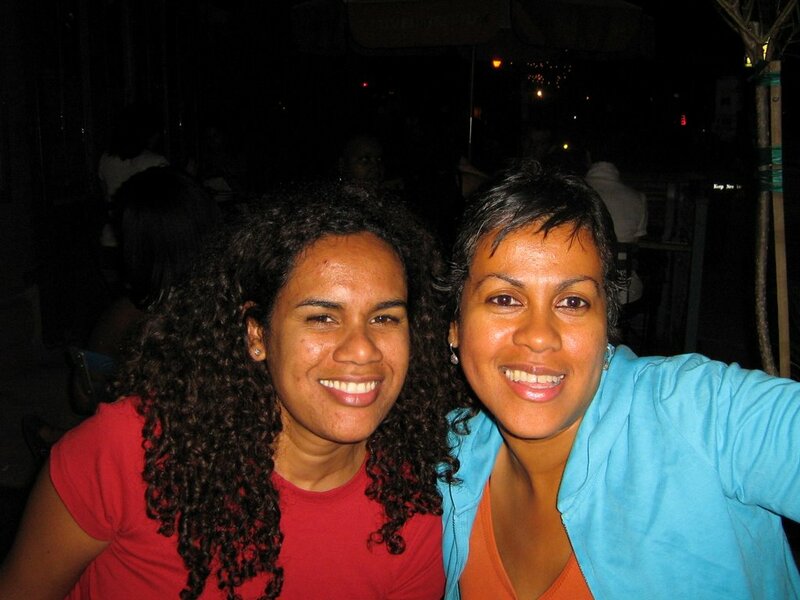 One particularly prolific island-based netizen, Pierrot Dupuy, keeps a blog updated several times a day that focuses on the island's and nearby independent Mauritius' current affairs. Another blogger, Jean-Paul, summarizes the island's main news on his blog Dijoux.re every sunday.